Sourdough has a long history going back to the gold miners who crisscrossed California and Alaska in their search for gold. 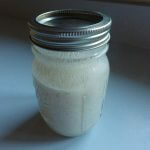 All sourdough recipes started with something referred to as a sourdough starter. This was a growing yeast culture kept active in a crock or jar. 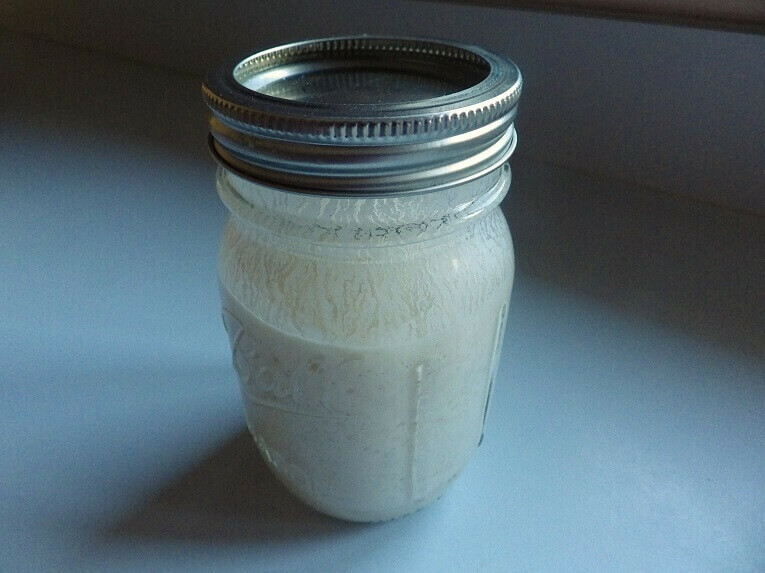 The sourdough starter took the place of yeast in the 1800’s when yeast was rare and hard to come by. 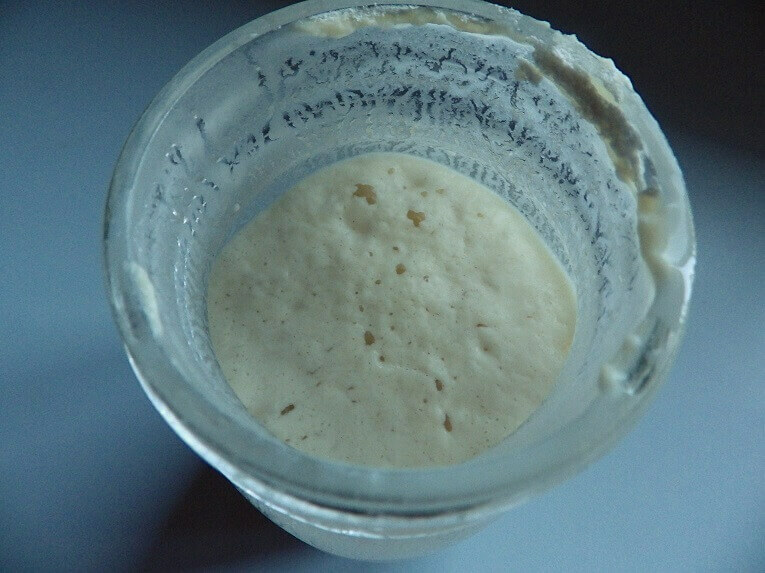 The starter itself started with a touch of yeast but the addition of flour, water and sugar kept the sourdough culture alive. 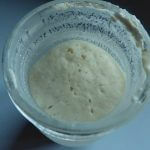 It’s believed that some sourdough cultures used in bakeries in San Francisco have been alive and well for more than a century. 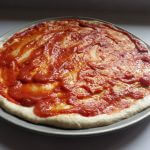 In order to make a sourdough pizza crust you have to make a sourdough starter. 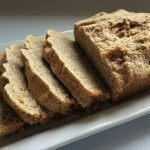 You could buy a starter at some grocery stores like Whole Foods but making your own is easy. 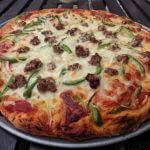 You can keep it going if you choose but for the sake of this recipe we’re going to make just enough for the crust. In a one-pint canning jar combine the warm water, sugar and yeast and tighten the cap. Shake briefly to dissolve and incorporate the ingredients. Add the flour and recap with the cap loosened. 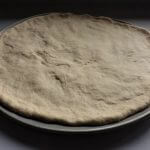 Once your starter is bubbling you can make your sourdough pizza crust. 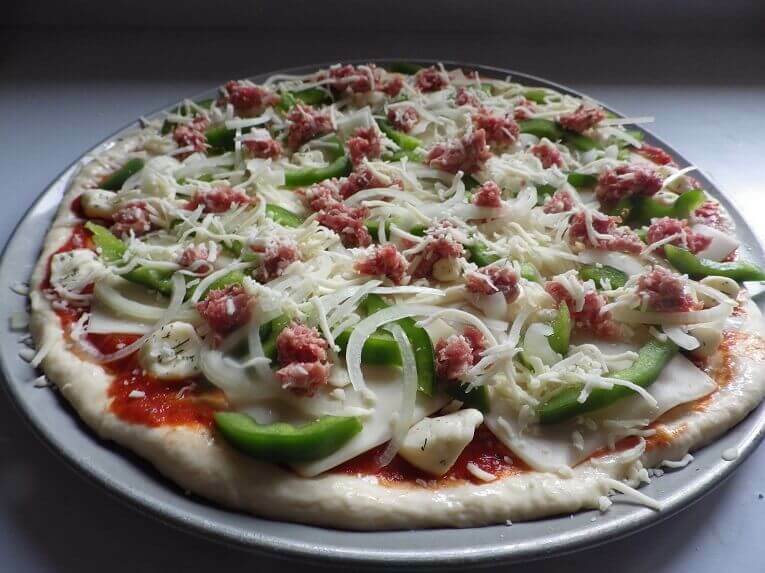 It’s easy to do in your bread machine but you’ll want to look for a pizza dough setting. 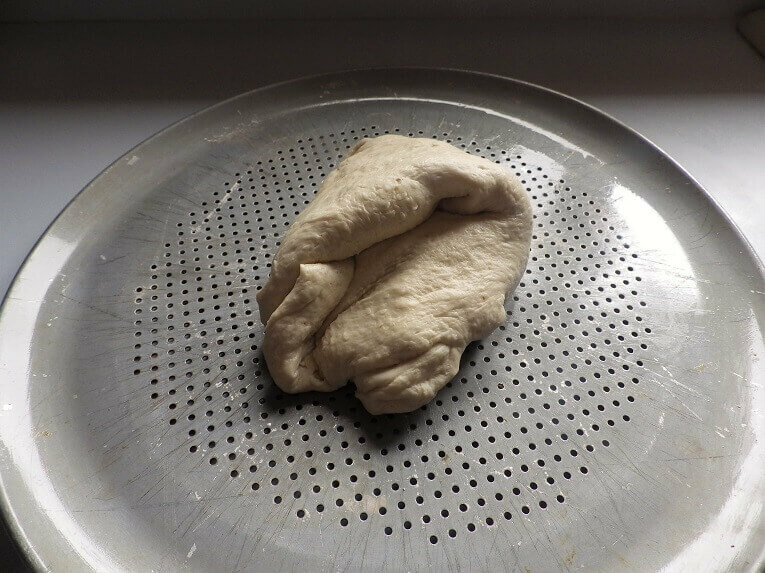 Many bread machines have a dedicated pizza dough setting. If you’re machine does not you can use the regular dough setting but remove the dough after the rising cycle before it bakes. 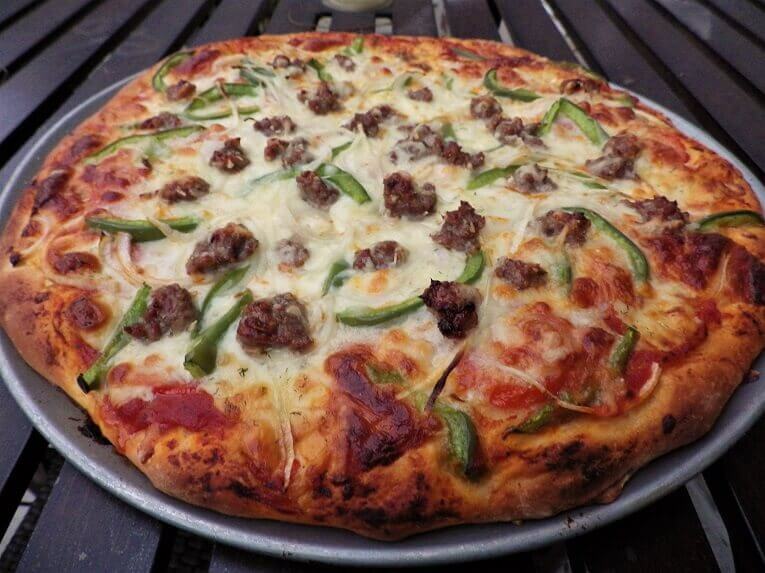 The most fun after you’ve made the sourdough crust is topping it with your favorite toppings. 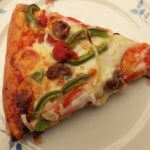 It usually starts with a pizza sauce followed by vegetables and meats like Italian sausage or pepperoni. Put all the ingredients in the bread machine in the order indicated in the ingredient list. 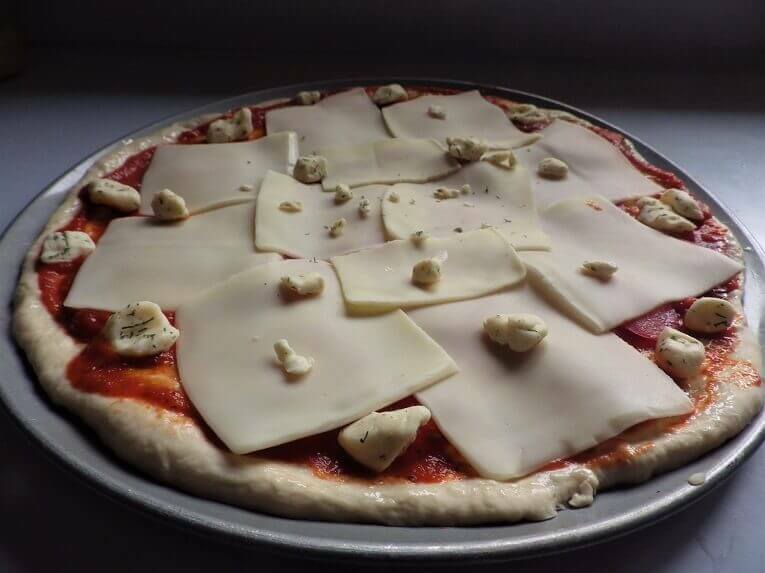 Select the pizza dough cycle and start. 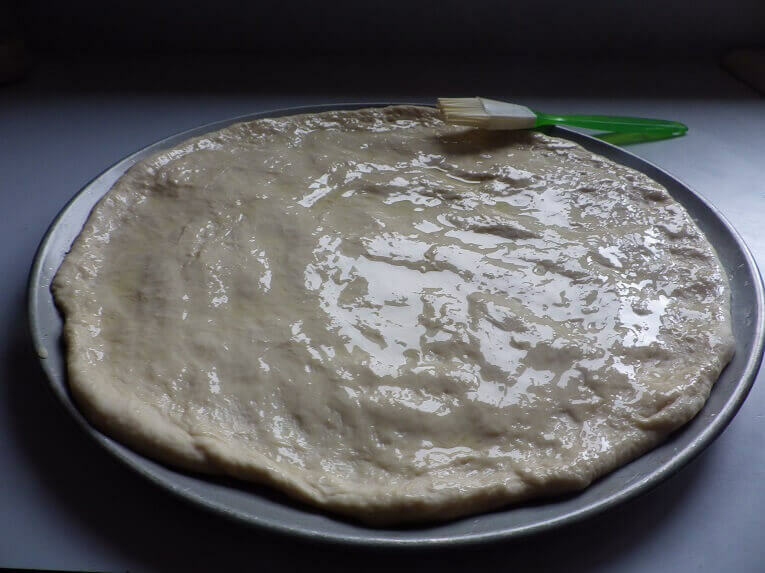 When the dough is done, take the dough out of the machine and place into a bowl lightly greased with olive oil. 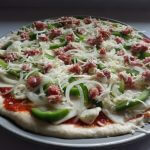 Roll the dough around to coat it and cover and let rise on the counter for about ½ an hour. 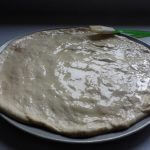 Cut the risen dough ball in half and knead lightly. 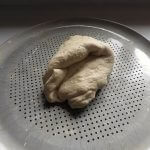 Roll the dough and pull into a circle while also using the heel of your palm to press it out. 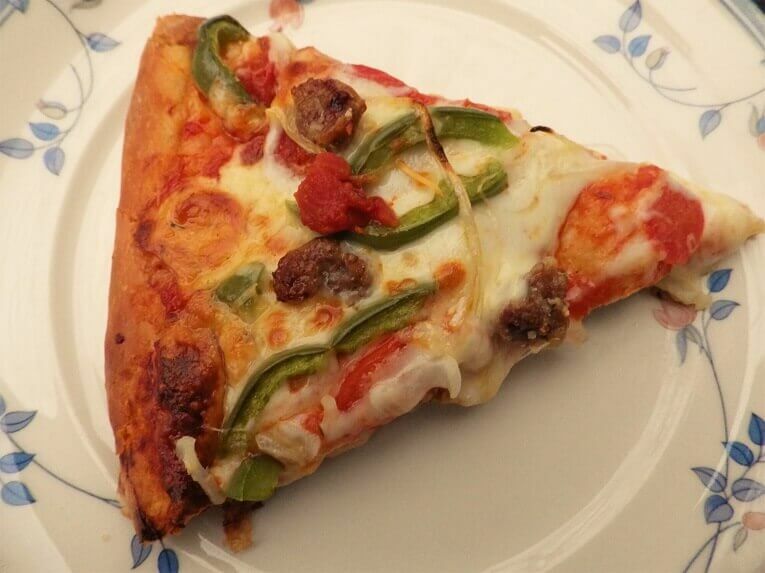 Place on lightly oiled baking tray or pizza pan. Gently push and press to the edges of the tray or pan. 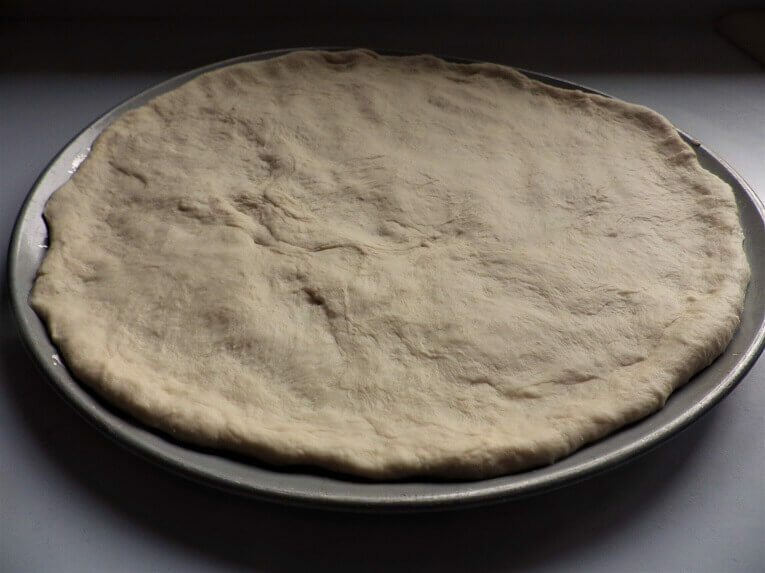 Let the dough rise on the pan or tray for 10 to 20 minutes. Drain the tomatoes. 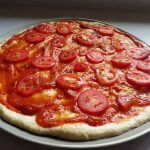 Put all ingredients in a food processor or blender and process until tomatoes are pulverized into a sauce. Save the extra sauce in a canning jar in the refrigerator. It will keep for up to two weeks. 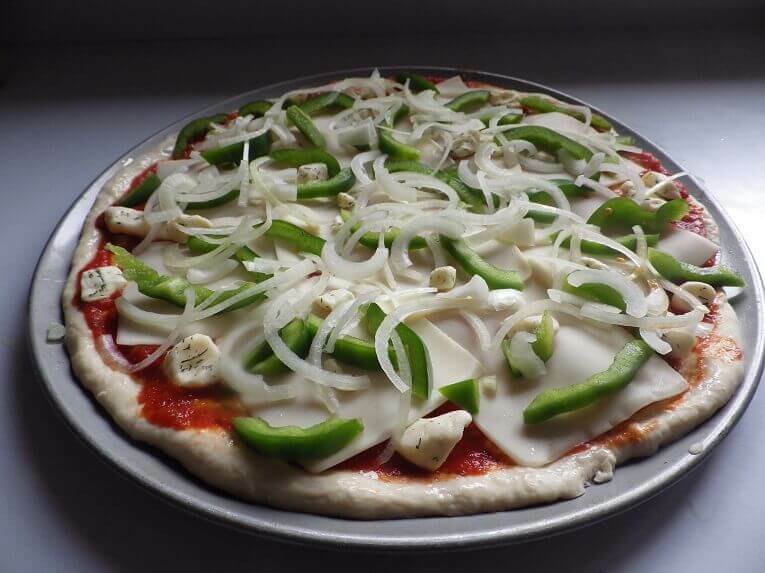 Rub the olive oil on the crust that’s stretched across your pizza sheet. 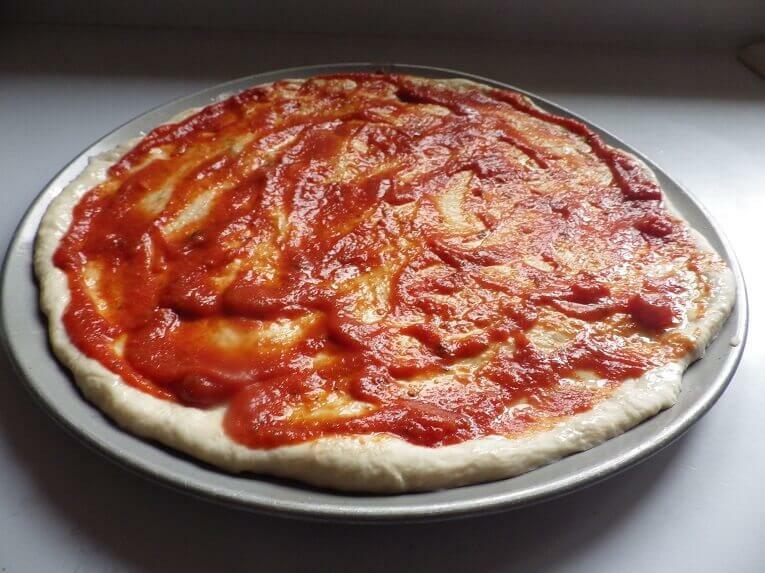 Spoon the tomato sauce in a widening circle. Don’t use too much. 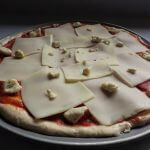 Cover the sauce with the mozzarella slices or most of the shredded mozzarella if you prefer the shreds to the slices. Dollop with some mozzarella curds if you like. 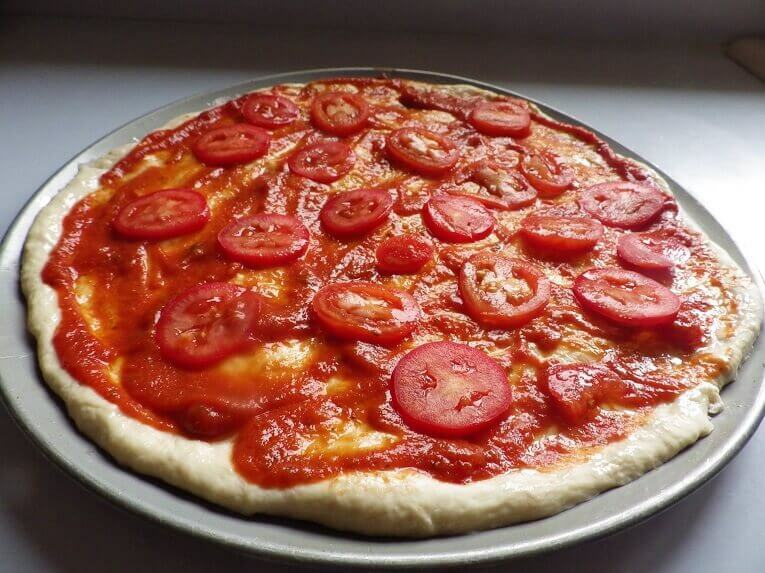 Place the tomato slices around the pizza. 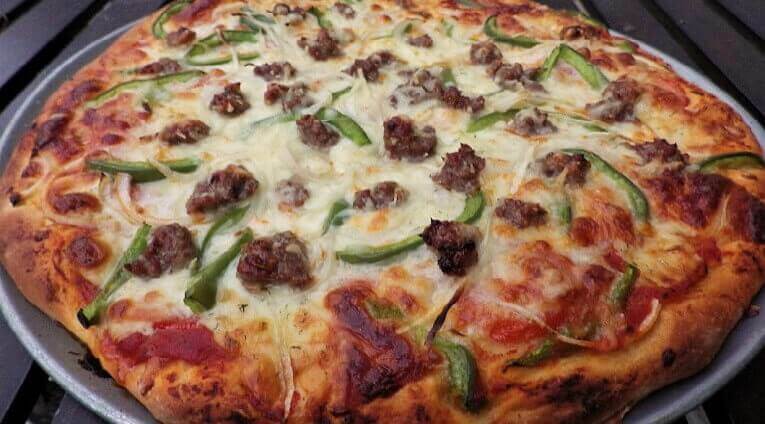 Drop the bell pepper slices around the top of the crust. Break up the onion slices and sprinkle the slivers around the top. 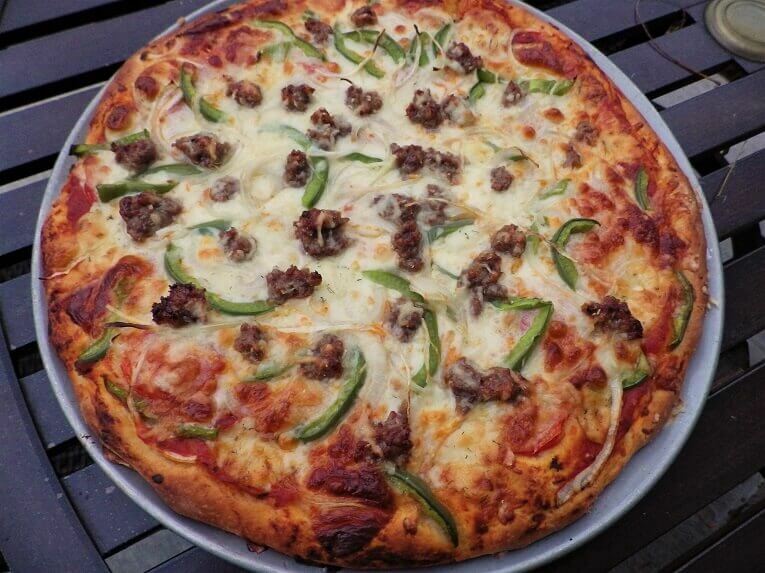 Break off pieces of the Italian sausage and dot the top of the pizza. 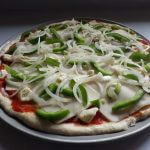 Sprinkle a little shredded mozzarella around the top if you want. Bake 15 to 20 minutes on the middle rack. Check after 10 minutes. 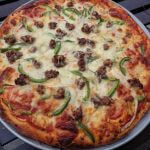 You want to lift the crust and take a peek to make sure its crisp and that the mozzarella has started to barely brown. It could happen faster or slower depending on your oven. 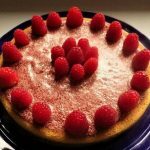 When done, either cut into triangular or square slices and serve.